Have you been shopping around for a Media Center PC for your home but you find the current models a bit too industrial looking? Perhaps the stylish Kapsel Media Center PC is just what you need. The Kapsel was designed by Propeller, an award-winning Swedish design agency. Kaspel utilizes a small form factor (27x23x10 cm) which allows for some flexibility as it can be positioned either horizontally or vertically as well as mounted to the wall. The Kapsel shell is made out of quality ceramics which adds to its aesthetic appeal. 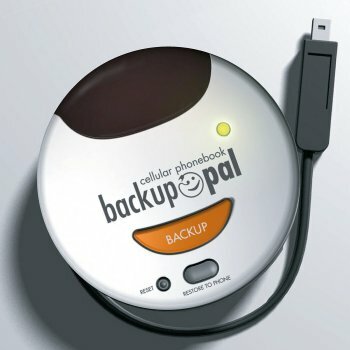 The Backup Pal allows you to back up data from your mobile phone onto this little gadget so you have the information saved in the event that you lose your phone or are switching phones. The cool thing about the Backup Pal is that it does not require a PC or software to do the backup of your phone contacts. The device comes with interchangeable adapters to fit virtually any mobile phone on the market, and it also has an IrDA option to transfer the data wirelessly, along with a USB adapter for USB phones, or you can hook it up to your computer and back it up there if you want to. Are you looking for a digital SLR that offers a “Live” view via the LCD? Olympus has released the EVOLT E-330 – the world’s first digital SLR to offer live viewing through the Color LCD. 14-45mm f3.5-5.6 lens. Standard with the E-330. 18-180mm f3.5-5.6 Ultra Zoom lens. A portable digital lens with 10x telephoto. Live View LCD. The EVOLT E-330 boasts the world’s first Live View LCD on an interchangeable lens SLR. The Evolt also contains a traditional optical through-the-lens viewfinder. 29 Shooting Modes. 20 user-friendly pre-set shooting modes – including underwater modes, a new Nature Macro mode and Panorama. Watch out Emeril and Bobby Flay, a whole new cadre of amateur chefs are about to achieve a level of cooking previously reserved for celebrity chefs. Vita Craft has introduced Smart Range, a new line of intelligent cooking technology that helps you create healthier, easier meals – every time. The Smart Range cookware utilizes an RFID computer chip that is built into each pan handle. The chip is used to communicate with the cook top and recipe cards and monitor each cooking step for a particular dish. The RFID chip in each Vita Craft pan handle is specifically designed for that type of pan. The pans themselves are superior-quality, multi-ply steel pans with a smooth-surface. The 100% American-made, high-conductivity Vita Craft pans are self-sealing, simple to clean and ensure that hapless cooks can prepare food flawlessly. This is the Docupen RC800 Professional (DPEN-RC800), and it allows you to scan documents on the go. It is complelely battery powered, so there are no cords, and it is able to scan an entire page in black and white or in color, in only 4 seconds. You can also choose to scan at standard or high 24 bit color resolution, and choose from 100 to 400 dpi. The docupen will hold over 100 pages while doing this and can transfer it into included Paperport software which helps manage and combine the pages into one or many documents. Notice anything missing from this keyboard? All the keys are there, but no letters are on them. This is Das Keyboard II which is a 100% blank keyboard, with no letters or numbers at all on the keys. There are some special marks on the “home” keys (man does that bring back some repressed junior high memories), which help you find your place by touch, but other than that you are on your own. Think you are good enough on the keyboard to master typing, programming or gaming without looking. Even if you do have the habit of looking, this blank keyboard isn’t going to help you out. Good luck. Slim like a credit card. 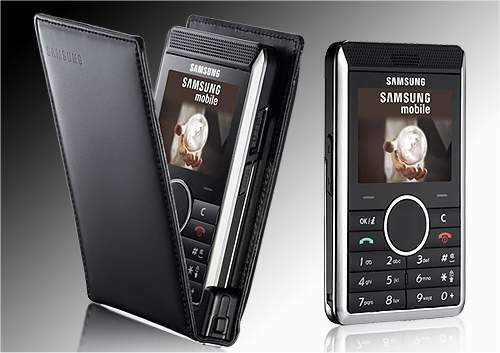 Samsung has done a great job of improving their previous Card Phone with the new Card Phone II, which is officially called the Samsung SGH-P310. The distinguishing feature of this mobile phone is obviously it’s thickness, or the lack of thickness, actually. At only 8mm thick, this is a seriously thin phone, and with the new design of a shiny black case it is perfect for travelers who want to have the smooth sharp look with their mobile device. 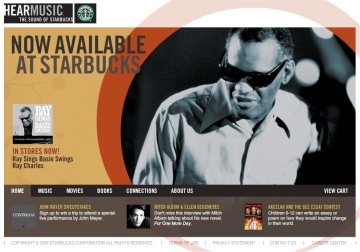 Starbucks and Apple today announced the availability of the Starbucks Hear Music catalog on the iTunes Store. This is great news for iTunes users as they will now have the ability to preview, buy and download a wide variety of Starbucks popular Hear Music tunes. Hear Music produces a wide range of albums which showcase both new and classic artists. Popular collections like the Artist Choice series, Opus Collections, and Debut Series releases make this a popular brand among coffee and music aficionados. The iTunes Store will showcase the Starbucks Hear Music offerings in a special new Starbucks Entertainment section. 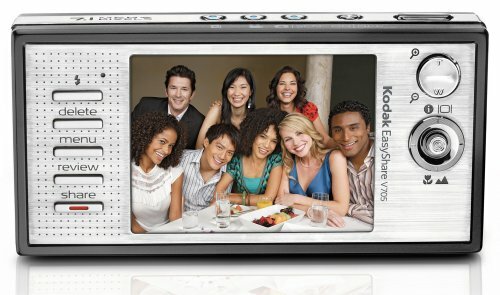 If you are a snapshot photographer like me, I can’t think of a feature set in a camera better than the new Kodak V705. An upgrade from the similar Kodak V570, the V705 has added a few upgrades including a 7.1 megapixel CCD. The Kodak V705 is a dual lens camera with dual sensor as well. Nokia says their new 5200 mobile phone has a street smart design, and I have to agree with this one. This phone has a simplistic look that makes it easy to use and straight forward. No excessive bling or anything that will bring on any unnecessary attention. It almost looks like a phone you might use for talking. Of course, the Nokia 5200 is a new mobile phone that has been recently released, so you know it’s not just for talking. Behind this unassuming exterior is a mobile phone that has all the features you would expect from a phone these days. It covers the big three frequencies (900/1800/1900), so you can go places, lots of places. And it travels well at only 85cc and 92mm tall. I have to be honest; I’ve never even seen Desperate Housewives. Regardless of my TV viewing preferences, Desperate Housewives: The Game has been released for the PC. The game begins by creating a housewife. Your new housewife is an entirely new character that just moved onto the street. From there, the interaction between characters features all the drama you would expect from the women of Wisteria Lane. You progress through the game by talking to the other housewives and completing little tasks that may arise out of those interactions. The video-game industry is intently watching to see if Desperate Housewives can attract more women gamers. Female gamers are a large growth area and remain one of the most elusive goals for developers and publishers. I don’t know how many times I have been in a jam where I needed to move some files and my pathetic USB key fob didn’t have the necessary space to hold my files. 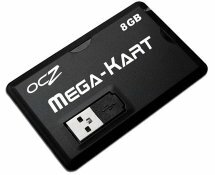 Well, if you are looking for some serious potable storage, the Mega-Kart by OCZ Technologies may just be the device for you. The Mega-Kart gives you 8GBs of memory in a super tiny case (84mm x 53mm x 4mm). The Mega-Kart has built-in, high-speed USB 2.0 cable which allows you to access your files from the convenience of any USB port. The Mega-Kart can also be used as an external drive to play music and movies, view images, or open files. The Mega-Kart also has an LED to signal read/write activity. Best Buy announced today the release of its Best Buy Digital Music Store. This new service will give music lovers yet another option in the increasingly competitive digital music domain. The new digital music service is powered by the RealNetworks Rhapsody 4.0 music service, and features both a permanent download store and a subscription download service. This announcement is great for consumers who will now have even more options for purchasing digital music. Best Buy has a long road ahead of them with competitors like the iTunes Music Store dominating with over 80% market share and the recent launch of the Microsoft Zune Marketplace. Alvarion, the world’s leading provider of wireless broadband and specialized mobile networks, today announced the availability of its BreezeMAX 2300 and BreezeMAX 2500 to North America and Other WiMAX Markets Worldwide. 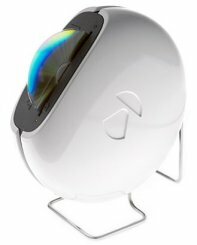 Employing the IEEE 802.16e standard, Alvarion plans to extend the popular WiMAX platform to new frequencies by extending the BreezeMAX platform to address the 2.3 and 2.5 GHz bands available in North America and the rest of the world. The BreezeMAX 2300 and BreezeMAX 2500 are extensions of Alvarion’s successful BreezeMAX platform which was one of the first WiMAX systems to launch in 2004. The BreezeMAX devices are expected to begin shipping in the fourth quarter of 2006.